You are here: Home / A-Blog / Is That Russia Troll Farm an Act of War? This Russian troll farm is “the equivalent (of) Pearl Harbor,” says Cong. Jerrold Nadler, who would head up the House Judiciary Committee, handling any impeachment, if Democrats retake the House. When MSNBC’s Chris Hayes pressed, Nadler doubled down: The Russians “are destroying our democratic process.” While the Russian trolling may not equal Pearl Harbor in its violence, said Nadler, in its “seriousness, it is very much on a par” with Japan’s surprise attack. When Republicans discuss Iran on Capitol Hill, the phrase “regime change” is frequently heard. When the “Green Revolution” took to the streets of Tehran to protest massively the re-election of President Mahmoud Ahmadinejad in 2009, Republicans denounced President Obama for not intervening more energetically to alter the outcome. Why is this conspiracy and collusion with Russians less worthy of Mueller’s attention than a troll farm in St. Petersburg? How can we encourage Netanyahu to Indict Obama for meddling in their elections so Trump can green light his extradition?? What if Putin fought back against this and released documents showing how we interfered in their election and others? Pretty sure they have that information. Information is a commodity – when it comes to intelligence, the Russians are not novices in the game. If 13 Russians is a troll farm and an act of war, what do we call then President Obama’s direct meddling in the elections in Israel and his meddling in the Brexit vote? Certainly those are acts of war! Russia, the Soviet Union, or Communist Party have been involved in American politics openly or clandestinely for over a hundred years. 13 indictments from Mueller, pffffft. Inquiring minds would LOVE to know how Hillary screwed the Ruskies and got them on the revenge train. It would probably make a great book and movie. They no doubt had their noses out of joint that that seamless liar double-crossed them some how. Meh, I don’t know. I think it’s a pretty interesting strategic and philosophical question for the cyber era. I mean if they physically destroyed infrastructure, say a prominent shipping port, with a bomb that would be obvious right? What if they achieved the exact same end by dicking up the computer automation? What about screwing up the electric grid or water treatment? Still great financial hazard, physical destruction, and health risk to citizens. What would be our allowable response to such an “attack”? Not agreeing with PB, but it is a thoughtful question. I hope not! The only person worthy of that is Michael Flynn who likely set up this sting should a pardon even ultimately become necessary. Manafort is sleazy and his now prosecuted acts were some time back and same applies to Gates – therein they are tied to Skadden + Podesta & Co. Manafort and Papodopolous were likely plants. Follow the money & connect the dots! 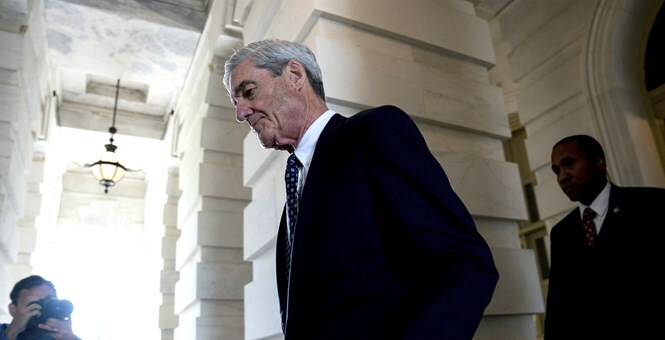 Mueller is a rotten communists liberal and literally insane.Trump better wake up because so much power in the hands of this fool will attempt to destroy America. I think the problem is that in order to control the world, the deep state and their globalist cronies need to get two countries under control – the US and Russia – and with Putin and Trump that isn’t working out too well. So what? The Russians had their own Political Action Committee during the election. BFD. Like, who doesn’t have a PAC of one kind or another during one of our presidential elections? I admit that the general writing, storylines and dialog in these latest episodes of our Kabuki Theatre/political soap opera since Trump have gotten better, but the “Russia did it” subplot has become ultra-boring. It’s just not working anymore and the writers and producers need to retire it and “move on”. Hell Pat, you should talk to the Master, …I started real wars just for fun, circulation, and profit. and you can’t even sell books anymore. 2020: A Democrat victory will lead us to war with Russia….